Among the sites participating in today's protest, most notable perhaps was Wikipedia, one of the most popular and well-trafficked websites in the world, whose English-language version was unreachable for 24 hours. 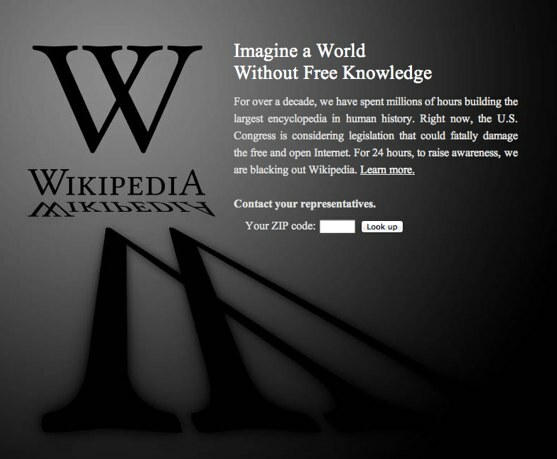 Instead of the collaborative encyclopedia and its millions of entries, visitors found a blackened page saying "Imagine a World without Free Knowledge" and a request that people contact their Congressional representatives to protest the legislation. When Wikipedia co-founder Jimmy Wales announced that the site would be shuttered for the day, he framed it in an unsurprising manner… unsurprising, that is, considering that one of the major controversies that swirls around Wikipedia is how its entries are used by students. And again, unsurprisingly, many students were shocked and outraged and frustrated that they weren't able to access the site today. Many took to Twitter to lodge their complaints about their inability to do their homework. And tech journalists took screenshots in turn, mocking their grievances. 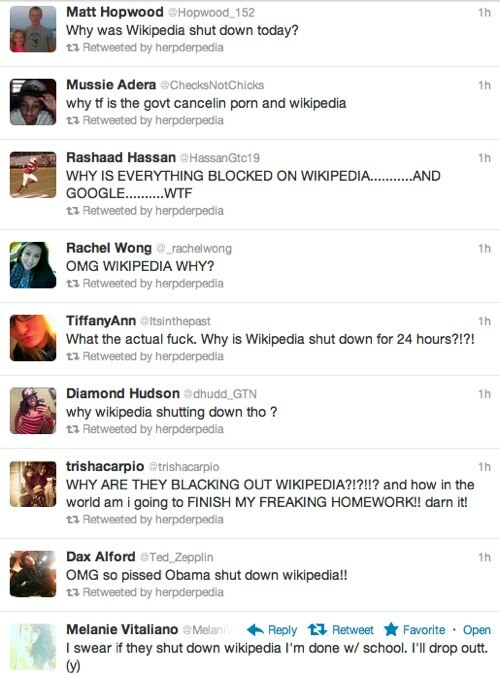 Gawker collected a number of them under the headline "Stupid High School Students and Teachers Freak Out Over Wikipedia Blackout." Someone created a Twitter-bot called @herpderpedia that retweeted Wikipedia-related laments. And even the RIAA's Senior Vice President of Communications Jonathan Lamy (vocal supporter of SOPA and PIPA) had a chuckle at students' expense, in a now deleted Tweet, saying "After Wikipedia blackout [sic], somewhere a student today is doing original research and getting her/his facts straight. Perish the thought." This view of Wikipedia as the go-to site for student-plagiarists and idiots is an old and tired one. The notion that visiting Wikipedia is a sign of weakness -- on the part of the student or on the part of the teacher making the assignment -- belittles a site that supports collaborative knowledge-building, something we should be encouraging students to think critically about, not avoid. See, I use Wikipedia regularly as a starting place for my research. When looking at the top few blue links that a Google search returns, I confess, I'm apt to click on Wikipedia first. I do know to look for the trail of edits and sources that comprise a Wikipedia entry. Students' frustrations that Wikipedia was unreachable today shouldn't be viewed as "proof" that the site is just a site for plagiarism or intellectual weakness. That attitude only feeds the viewpoints of the likes of the RIAA that see collaborative online efforts as at best suspicious and at worst stealing. It is a reminder, of course, that Wikipedia still remains a controversial educational tool. But if we aren't equipping students to research online -- with or without it -- we are doing students a great disservice. It's really not a laughing matter, no matter how anguished and silly their Tweets might have seemed today.